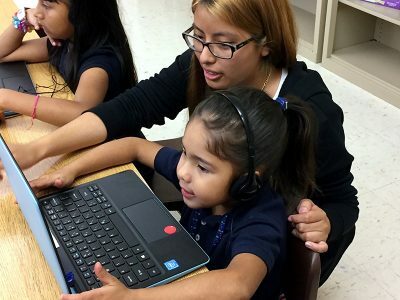 Volunteer Lorena Hernandez Garcia, a Hillsborough Community College–SouthShore Campus freshman, works with kindergarten student Mia Avellaneda, 5, during one of PCAT’s recent after-school tutoring sessions at Wimauma Elementary School. Fifteen years ago, Christene Worley noticed some of the youngsters in her church’s Bible study class couldn’t read very well. “I found that to be unacceptable; I wanted to find some way to help,” she said. She decided to start Parents & Children Advance Together (PCAT) Family Literacy Program, a ministry aimed at assisting at-risk children, ages 5 to 7, with reading and reading comprehension at no cost. Two other academic coordinators handle the programs at Ruskin Elementary School. To get her nonprofit organization started, Worley contacted the Hillsborough County Children’s Board, discussed her goal of starting a literacy program and was awarded a technical assistance grant that enabled her to hire a grant writer. 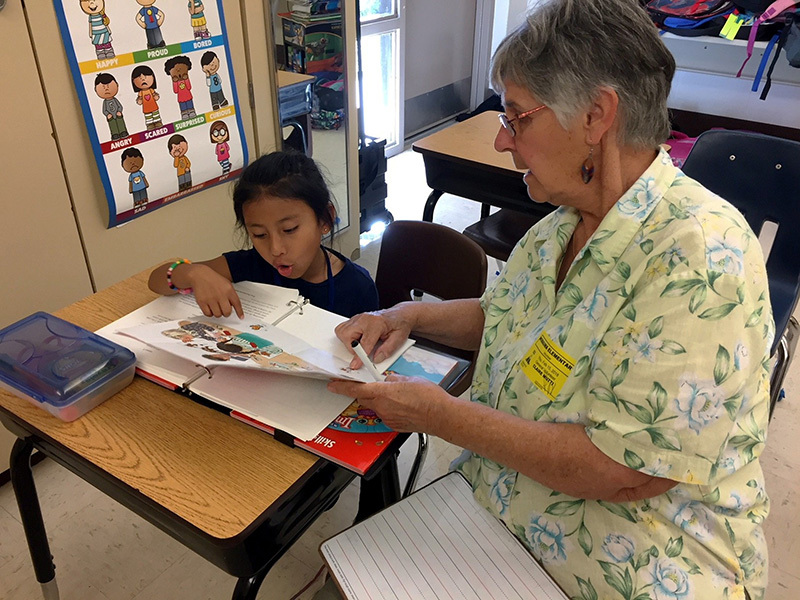 Claire Mutti, a PCAT volunteer from Sun City Center, listens as Wimauma Elementary School kindergartener Milki Ramos-Lopez sounds out a word in an exercise book that’s used to teach her to read. “I sought permission from the principal at Sulphur Springs Community School, where I first introduced PCAT, and after getting her okay, I went before the Hillsborough County School Board,” Worley said. Another grant from the foundation paid for all curriculum and the hiring of a Hillsborough County Schools reading specialist who created the academic portion of the PCAT program. Grants from the Community Foundation of Tampa Bay, Interfaith Council of Sun City Center and the Sun City Center Campaign Against Human Trafficking helped Worley bring PCAT to southern Hillsborough County. Volunteers, who are asked to work a minimum of one hour per week, are the heart of PCAT. Thus far, PCAT has been very successful, Worley said. If you’d like to invest in a child’s life, you can send a tax-deductible donation of any amount to PCAT, P.O. Box 1641, Lutz, FL 33548 or volunteer your time as a tutor/mentor by calling Worley at 813-598-2103 or emailing christene.pcat@gmail.com. For more information, visit www.pcatliteracyministries.org.